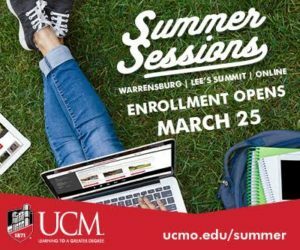 The UCM Board of Governors approved a tuition and fee increase to take effect fall 2019. 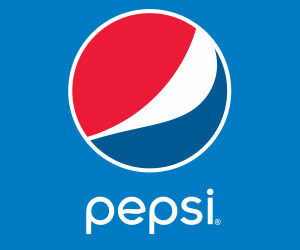 The 5% increase was approved March 15 at the Board of Governors meeting. 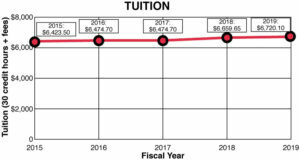 Tuition is increasing by $12 for on-campus undergraduate students and $15 for on-campus graduate students, according to a news release. Full-time flat student fees are also increasing approximately 1.3%. Bill Hawley, vice president of finance and operations, said the state changed the Higher Education Student Funding Act’s formula, which is determined by two factors: the change in consumer price index and how state appropriations to universities have changed over the past two years. 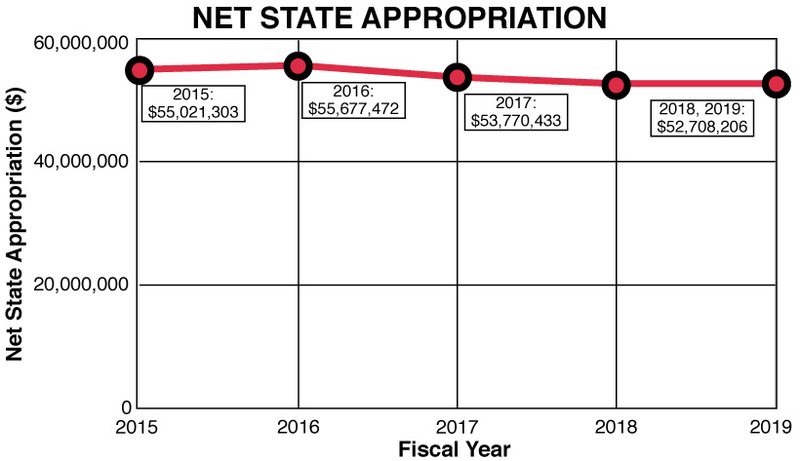 Net state appropriations have decreased since 2016. 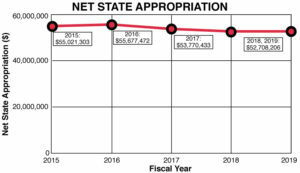 Hawley said there was a 1.9% increase in CPI and state appropriations dropped approximately $3 million since 2016, resulting in the increase. Hawley said the university books the full increase, but the university typically waives a portion for flexibility. 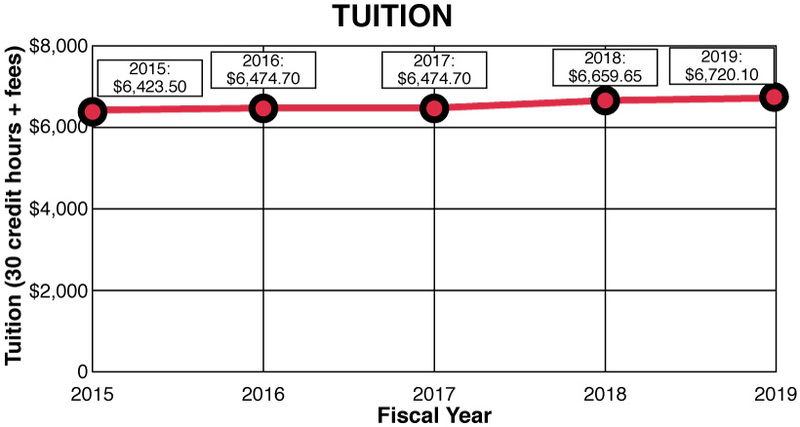 Tuition has increased since 2016. Hawley said the board approved the maximum rate of $7,735.15 for 30 credit hours for in-state undergrad students but waived $2.60 per credit hour from the rate. Hawley said the university can reinstate the waiver amount in certain cases, such as additional appropriation withholdings from the state. 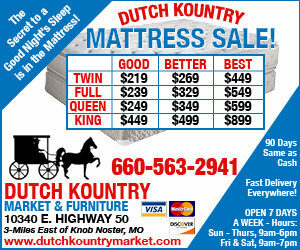 He said there are no plans to reinstate the booked rate at this time. “We could have, because our booked rates gave us more of a ceiling, gone higher than even what we did, but we backed it down so the overall impact was a 5% increase,” Hawley said. 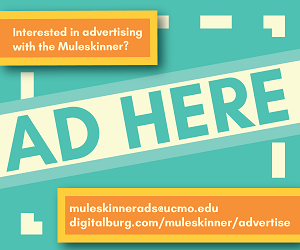 Hawley said tuition and fees increased primarily because of a decrease in state appropriations and an increase in operational costs, such as software licenses, faculty promotions and an increase in Missouri State Employees Retirement System, a retirement plan for university employees. President Roger Best said state appropriations were similar to that of 2003. Despite the increase in tuition and fees, Hawley said the University Foundation is looking to assist students. “The Foundation is trying to ramp up the fundraising in order to provide more assistance,” Hawley said. Hawley noted in a news release that scholarship funding has increased by 62% over the last decade, increasing 27% since 2016 alone. John Collier, president of the board, works to keep increases low. Collier said the increases were necessary to maintain quality of education, despite the decrease in funding from the state.